The article deals with the peculiarities of verbal aggression under modern conditions of communication. It states unconscious and conscious types of verbal aggression. Unconscious verbal aggression provoked by the low level of culture of communicants, inability to control their behavior in an emotionally demanding situation and the inability to foresee the consequences of communication acts as the primary form in the mind of the individual, provoking the existence of further deliberate verbal aggression of different levels of social danger. The study outlines and discusses three types of such aggression: compensatory, ignorant, and occasional. Conscious use of the contentious texts may have a different subjective position: from the communication necessary to ideologically driven. This also determines its division into three types (communicative, social, ideological), the content of which is analyzed from the perspective targets of the sender. It is noted that not all manifestations of verbal aggression can be considered an offence, as part of communication strategies involves the use of elements of aggressive behaviour in the process of communication, not carrying public danger. There are differences between the expression of insults and their identification as offense. Thus special attention should be paid to such communication, which is a public danger and is detrimental both to the society as a whole and its individual members. The article explores the relationship between the form of expression of aggression in the speech of the individual and the degree of public harm from insults to verbal extremism. 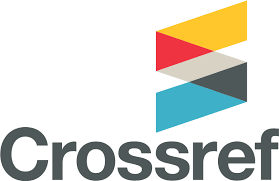 A special role in the process of interpreting the text of the addressee is actualized, which is not only a passive object of aggression on the part of the author of the text, but also an active interpreter, on whose abilities depend the results of the communication process. Басовская Е. Н. Творцы черно-белой реальности: о вербальной агрессии в средствах массовой информации // Критика и семиотика. 2004. Вып. 7. С. 257-263. Баучиева З. Б. Речевая агрессия и пути её преодоления // Современные проблемы науки и образования. 2015. № 2-1. С. 389-396. Внебрачных Р. А. Троллинг как форма социальной агрессии в виртуальных сообществах // Вестник Удмуртского университета. Сер. «Философия. Социология. Психология. Педагогика». 2012. № 1. С. 48–51. Голиков Л. М. Семиотика экстремистского текста // Уголовный процесс. 2014, № 7. С. 66–69. Злоказов К. В Экстремистский текст и свойства личности // Политическая лингвистика. 2013. № 3. С. 215-225. Копнина Г. А. Этическая норма и проблема речевого манипулирования // Русистика на пороге XXI века: проблемы и перспективы. М., 2003. Коряковцева О. А. Особенности реализации государственной молодежной политики в постсоветской России. Ярославль, 2008. Культура русской речи: энциклопедический словарь-справочник / под ред. Л. Ю. Иванова, А. П. Сковородникова, Е. Н. Ширяева и др. М., 2011. Майданова, Л. М. Агрессивность и речевая агрессия // Речевая агрессия и гуманизация общения в средствах массовой информации. 1997. С. 9-13. Осадчий М. А. Использование лингвистических познаний в расследовании преступлений, предусмотренных статьей 282 Уголовного кодекса РФ // Юридический консультант. 2006. № 12. С. 18-23. Попова А. А. Речевая агрессия в СМИ как способ манипулирования сознанием человека // Молодой ученый. 2015. №14. С. 697-700. Сковородников А. П. Языковое насилие в современной российской прессе // Теоретические и прикладные аспекты речевого общения. 1997. Вып. 2. С. 10–15. Стилистический энциклопедический словарь русского языка / под ред. М. Н. Кожиной. М., Наука, 2011. Щербинина Ю. В. Русский язык: речевая агрессия и пути ее преодоления. М., 2004. Щербинина Ю. В. Методы диагностики речевой агрессии // Прикладная психология и психоанализ. 2001. № 3. Basovskaya E. N. Creators of black-and-white reality: on verbal aggression in the media [Tvortsy cherno-beloy realnosti: o verbalnoy agressii v sredstvah massovoy informatsii // Kritika I semiotika] // Criticism and semiotics. 2004. Vol. 7. P. 257-263. Bauchiev Z. B. Verbal aggression and ways of its overcoming [Rechevaya agressia I puti eio preodoleniya // Sovremennye problem nauki i obrazovania] // Modern problems of science and education. 2015. No. 2-1. P. 389-396. Extramarital R. A. Trolling as a form of social aggression in virtual communities [Trolling kak forma sotsialnoy agressii v virtulnyh soobschestvah // Vestnik Udmurtskogo universiteta] // Bulletin of Udmurt University. Ser. "Philosophy. Sociology. Psychology. Pedagogy". 2012. No. 1. P. 48-51. Golikov L. M. Semiotics of extremist text [Semiotika ekstremistskogo teksta // Ugolovniy protsess] // criminal trial. 2014, no. 7. P. 66-69. Zlokazov K. Extremist text, and the properties of the personality [Ekstremistskiy tekst I svoystva lichnosti // Politicheskaya lingvistika] // Political linguistics. 2013. No. 3. P. 215-225. Kopnina G. A. Ethical standards and the problem of speech manipulation [Eticheskaya norma I problema rechevogo manipulirovaniya // Rusistika na poroge XXI veka: problem I perspektivy] // Russian studies on the threshold of XXI century: problems and prospects. 2003. Koryakovtseva O. A. Features of realization of the state youth policy in post-Soviet Russia. [Osobennosti realizatsii gosudarstvennoy molodyozhnoy politiki v postsovetskoy Rossii] Yaroslavl, 2008. Culture of Russian speech : encyclopedic dictionary [Kultura russkoy rechi: entsiklopedicheskiy slovar-spravochnik] / ed. by L. Yu. Ivanov, A. P. Skovorodnikov, E. N. Shiryaev, etc. M., 2011. Maidanova, L. M. Aggression and verbal aggression [Agressivnost I rechevaya agressiya // Rechevaya agressiya I gumanizatsia obscheniya v sredstvah massovoy informatsii] // Verbal aggression and humanization of communication in the media. 1997. Pp. 9-13. Osadchy M. A. 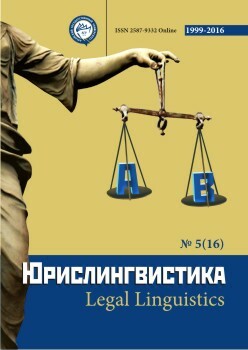 The use of linguistic knowledge in the investigation of crimes under article 282 of the Criminal code of the Russian Federation [Ispolzovaniye lingvisticheskih poznaniy v rassledovanii prestupleniy, predusmotrennyh statyoy 282 Ugolovnogo kodeksa RF. // Yuridicheskiy consultant] // Legal Advisor. 2006. No. 12. S. 18-23. Popova A. A. Verbal aggression in the media as a way of manipulating the mind of man [Rechevaya agressiya v SMI kak sposob manipulirovaniya soznaniyem cheloveka // Molodoy uchyoniy] // Young scientist. 2015. No. 14. P. 697-700. Skovorodnikov A. P. Linguistic violence in contemporary Russian press [Yazykovoye nasiliye v sovremennoy rossiyskoy presse // Teoreticheskiye I prikladnye aspekty rechevogo obscheniya] // Theoretical and applied aspects of speech communication. 1997. Vol. 2. S. 10-15. Stylistic encyclopedic dictionary of Russian language [Stilisticheskiy entsiklopedicheskiy slovar russkogo yazyka] / ed. by M. N. Kozhina. M., Science, 2011. Shcherbinina, Y. V. Russian language: verbal aggression and ways of its overcoming [Russkiy yazyk: rechevaya agressiya I puti eyo preodoleniya.]. M., 2004. Shcherbinina, Y. V. Methods of diagnostics of verbal aggression [Metody diagnostiki rechevoy agresii // Prikladnaya psihologiya I psyhoanaliz] // journal of Applied psychology and psychoanalysis. 2001. No. 3.